When you extend a letting it is best to put this in writing so that both you and your landlord have proof of your decision. Such letters can be brief, but they should always include information on who you are (all tenants' names), your new letting period, the agreed upon rent for this period and any requirements for moving out during this period. These details should all be included in your contract, but repeating them in a letter to extend a letting is a good way to summarise your agreement as well. These letters should be formatted formally. The names of everyone living in a property should be included in a letter to extend a letting. If the property is rented by a family then this might be acknowledged, such as by writing "Tom and Marie Welling and our children". Marriages might be acknowledged as well, either by writing "Tom and Marie Welling" or "Tom Welling and my wife Marie Short". If the names of all flatmates are not known because the tenants are allowed to find new flatmates then this might be acknowledged by writing "Myself and two future flatmates" or something similar. Details of the new letting period should be included in a letter to extend a letting. Usually this just means including the date on which the new tenancy begins and the date on which it will end. If there is a specific date by which the tenants must let the landlord know if they will continue to extend the letting then this might be included as well. A letter to extend a letting should also include details of the agreed upon rent for the tenancy period. The amount of rent to be paid, how often rent is to be paid and the method by which rent will be paid can all be included in such a letter. 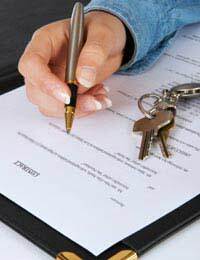 If there are any requirements that tenants must meet in order to move out and recover their security deposits during the agreed upon tenancy then these may be written into a letter to extend a letting as well. Often these requirements would include giving a certain amount of notice and/or securing new tenants to take over the lease. A letter to extend a letting should be formatted formally. The mailing address of both the writer and recipient should be included, as well as the date. Letters should include more formal salutations and closings and employ polite, professional tones. These letters should be typed. Delivery by hand or by post is appropriate for a letter to extend a letting. Please consider this letter confirmation that my wife, Sandra, and I will be extending our letting of [Property Name or Address] for another year. As agreed, we will pay [Monetary Amount] per [Time Period] via [Payment Method] on the [Day or Date] of each [Time Period]. These rent details will be in effect for the entirety of the extended tenancy period, from [Date of Tenancy Start] to [Date of Tenancy]. Also as agreed we will give you [Amount of Time] notice if we intended to move out during this period.